a sudden reflex or involuntary movement. Achilles jerk (ankle jerk) plantar extension of the foot elicited by a tap on the achilles tendon, while the patient is seated on a bed or chair, with feet hanging freely; called also Achilles reflex and triceps surae jerk or reflex. elbow jerk involuntary flexion of the elbow on striking the tendon of the biceps or triceps muscle. knee jerk see knee jerk. triceps surae jerk ankle jerk. the area around the knee joint, a hinge joint that is one of the largest joints of the body, sustaining great pressure. 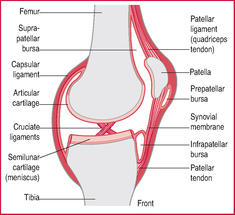 The knee is formed by the proximal portion of the tibia, the distal end of the femur, and the patella, or kneecap. The bones are joined by ligaments, and the patella is secured to the adjacent bones by powerful tendons. The fibula is attached at the side of the knee to the tibia. Two crescent-shaped pads of cartilage, one medial and one lateral, called menisci, lying on top of the tibia cushion it from the femur and form the gliding surfaces of the joint in motion. 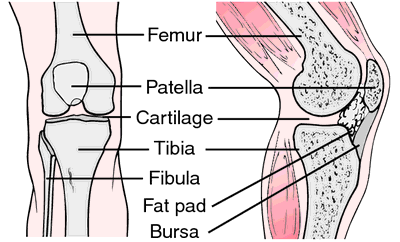 Further cushioning is supplied by bursae, which are located around the main joint, between it and the patella and on the outside of the patella. A capsule of ligaments binds the whole assembly together. The capsule is lined with synovial membrane, which secretes a lubricating synovial fluid that makes possible a smooth, gliding motion. Traumatic disorders of the knee are common and include dislocation, sprain, and fracture. Left: Knee joint, front view. Right: Knee joint, flexed in profile. knee jerk (knee reflex) a kick reflex produced by sharply tapping the patellar ligament. To test this reflex, the lower part of the leg is allowed to hang relaxed (such as by crossing the legs at the knees) and the examiner taps the ligament below the patella with a small rubber hammer. The normal reaction is contraction of the quadriceps muscle, causing involuntary extension of the lower leg. This is a stretch reflex; striking the patellar ligament stretches the quadriceps muscle at the front of the thigh and causes it to contract. Two nerves are involved; one receives the stimulus and transmits the impulse to the spinal cord, and the other, a motor nerve, receives the impulse and relays it to the quadriceps muscle. Inadequate response to the knee jerk test may mean that the reflex mechanism involved is in some way impaired. In some people with normal reflexes the jerk of the knee is so light as to be nearly imperceptible, and the examiner must make other tests to check the reflex mechanism. Called also patellar or quadriceps reflex. a sudden contraction of the anterior muscles of the thigh, caused by a smart tap on the patellar tendon while the leg hangs loosely at a right angle with the thigh. A reflex contraction of the quadriceps muscle resulting in a sudden involuntary extension of the leg, produced by a sharp tap to the tendon below the patella; patellar reflex. Knee joint. Diagrammatïc vertical section from front to back. reflex extension at the knee in response to tapping the tendon between the patella and the tibia; this stretches quadriceps muscle spindles, whence afferents to the spinal cord elicit transient reflex contraction. Tests the integrity and function of the relevant peripheral nerves and lumbar spinal segments. Syn patellar reflex. See also tendon jerk reflex. in large animals, the carpus; in small animals, the stifle. See Table 11.
conformation defect in which the metacarpus is not centered symmetrically to the carpus. scarred or otherwise imperfect appearance. used to mean that a horse has fallen and broken the skin over the carpus. an old-fashioned name for chronic carpitis in horses. a short strap used to strap up a horse's leg in a flexed position so that it is as immobile as a three-legged horse. A good form of restraint for a horse that is rearing. distention of the carpal sheath in the horse. Visible as a fluid-filled distention at the back of the knee.